Hello everyone! I’m back from my trip and I’ve missed my little blog so very much! While I was away, abortion I sampled some of the most delicious food I’ve ever tasted (a long post about that later this week). And I waited in line. Oh boy, approved did I want in line! Some of you may remember the Evil Ash Cloud that made air travel in Europe impossible a few weeks ago. I’m here to tell you – it was truly a nightmare. I was supposed to leave for Paris on Friday, April 16. On Thursday, all airports in France closed. My flight was canceled and I had to kiss my plans for Paris (and the all money for my rental apartment … and all my croissant-filled plans) goodbye. Since we were only supposed to stay for 4 days before heading to Rome, I told myself all was not lost. We were confirmed on a flight into Rome for Tuesday. I would only lose 3 days of my vacation. But the Evil Ash Cloud was spreading and I was getting nervous. What if my flight to Rome was canceled? I had to get myself to Europe. So we showed up at the airport Saturday morning and begged and pleaded our way onto a flight to Madrid that evening. I don’t know how we did it, but a very very nice lady named Maria helped us and we got on the standby list. We waited several long hours and somehow, we made it onto the flight! I jumped for joy like a little girl when they called our names and we were on our merry way to Spain. After we landed, we spent about 4 hours trying to figure out how to get to Rome. There was a lot of standing in line and I thought my feet were going to fall off by the end of it. In the end, we got a flight to Rome for Tuesday and spent 2 nights in Madrid. I know that we are some of the luckiest people on the planet for making it as far as we did when nothing in Europe was flying, trains were booked and rental cars were non-existent. It was hard to get there, but I am so glad we did! 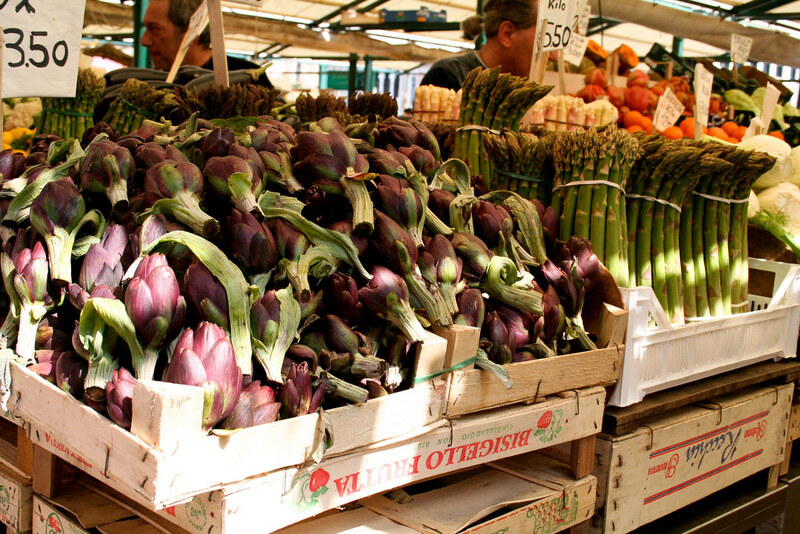 Still, I couldn’t get those baby artichokes out of my mind, so I bought up the best ones I could find here. Prepped and sliced, I just drizzled them with olive oil and roasted them. 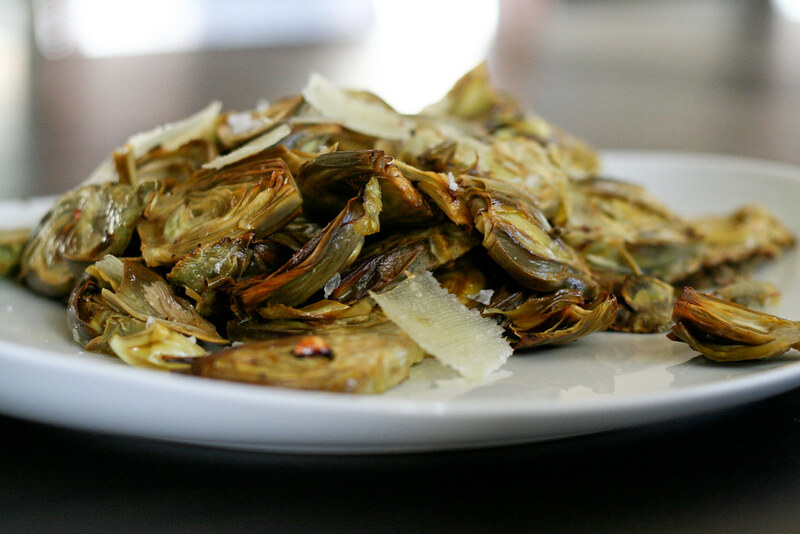 Toss with lemon juice and Pecorino cheese, salt and pepper and you’ve got a very simple, very delicious spring side. You can also toss them with pasta, couscous or your favorite grain for a nice little side salad. On a side note: I embellished the blog design a bit by adding that background picture. What do you guys think? Is the image too much? Let me know! Eat these as a simple side or toss them with hot pasta for a meal or cold pasta, couscous or grains for a cold or room-temperature side salad. Also good on a simple green salad. Preheat the oven to 400° and line a rimmed cookie sheet with parchment paper. Cut your lemon in half and set aside. Prep the artichokes by peeling off the hard outer leaves and cutting off the top 1/2-inch of the choke (Saveur has really good step-by-step instructions). Now slice them vertically into 4 pieces and rub them all over with a lemon half. Place them on the prepared parchment as you go. Once they’re all sliced, drizzle with the olive oil and use your hands (or a spoon if you’re fancy) to toss the chokes with the oil until coated. Bake for 12 minutes or until they’re tender. Remove from oven, place in a bowl and toss with lemon juice, Pecorino, salt and pepper. I like the picture, your white writing space is quite large so it stops it from being over-powering I think. I bet it would be easy to change to reflect the season too! How awesome that you went to Europe! Please blog about your eating experiences!! can’t wait to hear about italy, i’m heading there in a month :) i think i like the picture… a little jarring at first, but i think it’s good! Oooh, I have regular artichokes in the fridge waiting for me. My parents also just took a trip to Italy and I’m insanely jealous of everyone’s eating adventures. I can’t wait to be able to afford to travel again. Rocio – yeah, I couldn’t get used to it, so I’m back to a pretty basic pattern. I’m really happy with it – I think this one’s a keeper! I like this background better. It adds a personality without being too distracting. Rox – Thank you! I’m really happy with it! 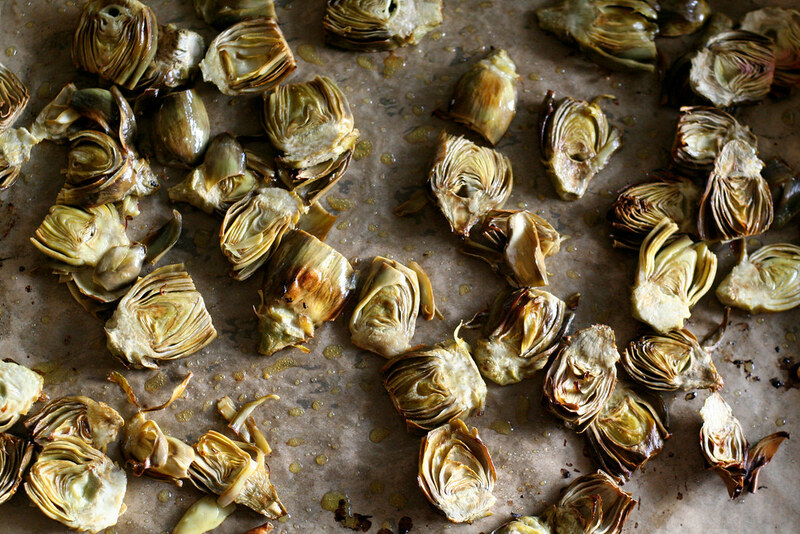 Love that photo of those roasted artichokes. Makes me wish I’d gone to the farmer’s market this morning. Love Italy. Love the quick recipe. Love the new background pic. You got it all goin’ on girlfriend! This looks incredible. I love artichokes! And as I keep poking around your blog, I am more & more in love with your recipes!